The Green Bay Packers Champions Club is a new, high-end seating area located above the south end zone of Lambeau Field. 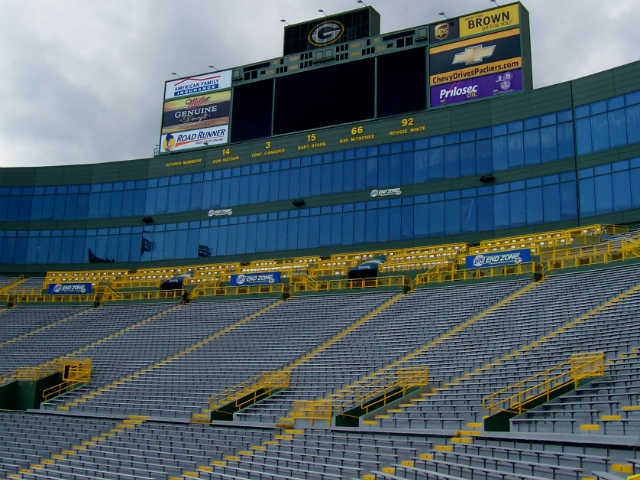 The Lambeau Field seating chart does not explicitly show the Packers Champions Club which is positioned above the seats in the Upper South End Zone. Comfortable, indoor seats with a table for food and beverages placed between each pair of seat. Due to the height from the field, the Champions Club offers a poor view of the game action. Seats are simply too far away to provide a clear view of the entire game. For fans who want exclusive amenities and a comfortable spot inside Lambeau Field, the Champions Club is a great choice. But fans who are looking for a good location to watch the Packers should consider other seating areas closer to the field. Packers Champions Club tickets were sold as full season ticket packages to long-time season ticket holders in the club and suite areas. The team keeps a formal waiting list for fans interested in buying tickets to any area of Lambeau Field. As such, anyone looking for individual game tickets to the Champions Club is unable to purchase tickets directly from the Packers. Secondary market ticket vendors and independent Packers ticket websites are the best choice for Champions Club tickets. Prices vary with opponent, team record, and weather, but expect to pay above face value for any ticket during the regular season.